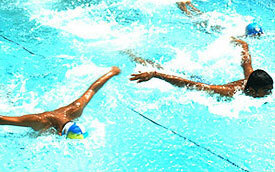 Play grounds and facilities for all major indoor and outdoor games and sports exist in the school. Besides football, cricket, basket- ball, volleyball, tennis, table tennis, carom, kho-kho and kabaddi, excellent facilities exist for horse-riding, gymnastics, swimming, athletics and school band. 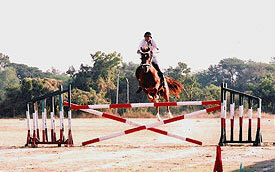 The school is a member of the Equestrian Federation of India. Our students and horses participate at the National and International Equestrian Championships every year and have been winning several medals, prizes and certificates of merit.